If you’re like me, your phone is an extension of your very self. It’s like something out of Blade Runner, they are these tiny computers that we keep with us that hold all of our information, we can buy stuff, learn stuff, and apparently make phone calls with them. Who knew!? Now, I use Android (yes, I’m one of THOSE geeks), but I also just picked Ian’s pocket, and he has an iPhone. So I’m gonna download a bunch of stuff on his phone, too, and see what the best apps are for both platforms…Sorry WindowsPhone users. Ok, now, on the Android platform, apps are a bit more sparse, but that doesn’t mean you can’t be an expert in coffee while using one. Again, we’re looking only for stuff that’s free…Yes, I have a few paid coffee apps, and they’re great, but you guys don’t need the nitty-gritty nonsense I do. You can do pretty much everything that the paid apps can do on the free apps, TRUST me. So, put away your wallet, big spender. This one is really helpful for the casual drink orderer. It’s something that, if you work in a coffeeshop, you’d wish you had from day one. It has a breakdown of drink names, ingredients, and a visual representation of the drink itself. If you’re someone who isn’t the most familiar with the names that drinks have (yeah, I know, there’s like a million), this is a fantastic way to not only know what to call them, but to truly understand what you have in your cup when we hand it to you. This isn’t really much if you know all there is to know about everything involving coffee drinks, but if you’re an average Joe, this app is a perfect addition to your phone. 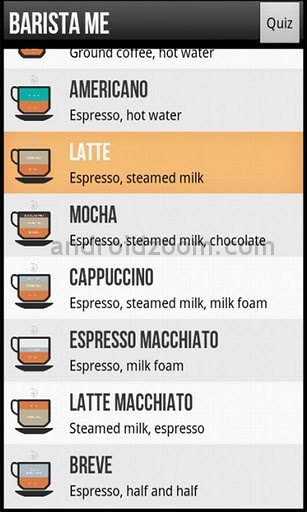 I currently have this one on my phone and I use it when people ask about what is in each drink, the little picture representations work wonders. This one is for the Power User!! Do you roast your own coffee and espresso at home? Are you thinking about it? I know some of our customers are trying to get into that, we’ve probably even talked about this app. It’s FREE, which is fantastic, and it’s also great for documenting your progress: what works, what doesn’t. 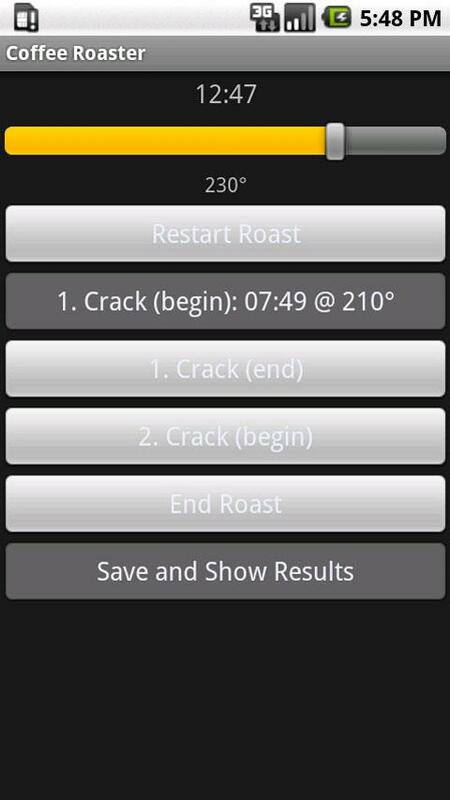 You adjust the app for what kind of roaster you’re using, what kind of bean, and from there you can mark down the temp you’re using, the roaster type, at what point the beans start cracking, and so on. I’ve suggested this one to a few of my pals that are working on doing this sort of thing, and it’s been a great help. 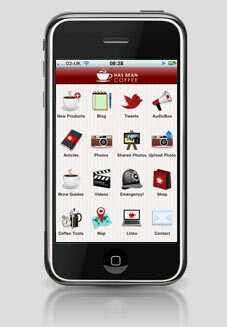 It’s got a really great user interface, and it gets regular updates. This one is a BIG recommend for the coffee geek. Wow!! Talk about a WONDERFUL app!! This thing has it all. It’s made by a UK company of the same name, and this app is pretty much all you need. It’s got recipes, methods, explanations of all kinds, and most amazingly, REALLY great instructional videos for preparing different types of single-cup brewing methods! The videos are fun, funny, and full of endearing quirks. The production value is that of something you’d see on TV, if not better. It also has timers, facts, tweets, articles and maps to the nearest coffeeshop. At the price of FREE, there is no reason to not have this installed on your iOS device. Alright, this one isn’t free. It’s $.99 on the AppStore. What Ian’s credit card doesn’t know won’t hurt him. Remind me to give him a buck…Ha! I’m kidding, I’m never paying him back. 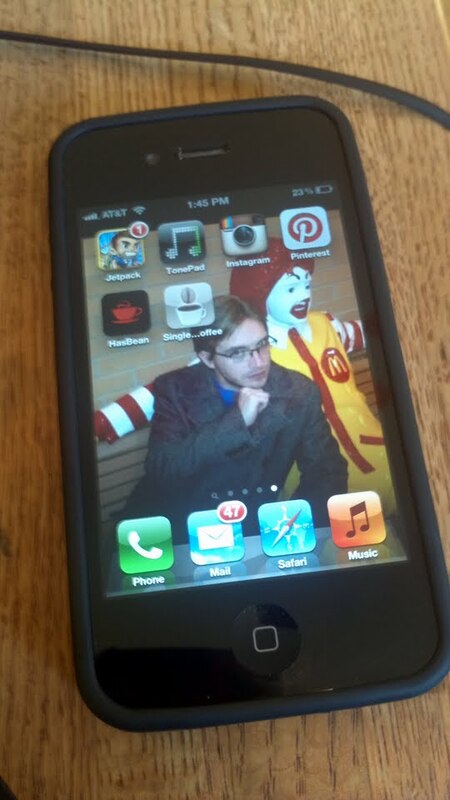 In fact, I think I’m putting this iPhone on eBay once I’m done with this blog. 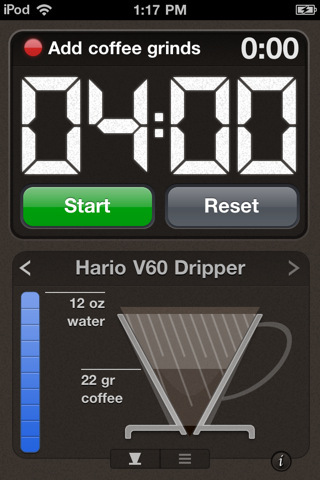 This is a really helpful app if you’re someone who loves pour over coffee or any single-serve brewing method. It’s got a kind of messy user interface, and it doesn’t have the greatest flow to it, especially considering the iPhone’s processor and the stuff I know it’s capable of…But that’s less of an issue of the phone and more of an issue of shotty programming. Still, it’s worth the buck for what it’s used for, it has pre-programmed timers depending on the type of brew you’re making. It’ll even hold your hand through the prep, when to add what, and how to finish it up. Well, that’s what I’ve got for apps. If you’ve got one you think I should be showing off, or if you’ve written one that you want me to spotlight, shoot me a line on here, tweet at me @grahams318 or just email me directly at grahamssocial@gmail.com . Also, I changed Ian’s background. He’s gonna love this. Who doesn’t want a picture of me on their phone?! ~ by grahamschocolate on February 18, 2012.